Handy Handout #468: Growing Out of an Auditory Processing Disorder Is it possible? Growing Out of an Auditory Processing Disorder Is it possible? An Auditory Processing Disorder (APD) is a neurological defect that affects how the brain processes spoken language or information. APD makes it difficult for a child to process verbal instructions or filter out even minimal background noise in the classroom. Educators may mistake a child with APD as one who may have Attention-Deficit Hyperactivity Disorder, or ADHD. Children with these two distinct disorders have very similar behaviors; therefore, the misidentification is easy to make. find it hard to follow spoken directions, especially instructions with multiple steps. say “huh?” or “what?” for others to repeat what they just said. are easily distracted by minimal background noises or loud, sudden noises. have trouble with reading and spelling, which require the ability to process and interpret sounds. struggle with oral (word) math problems. find it hard to follow conversations. find it hard to learn songs or nursery rhymes. have trouble remembering details of what they read or hear. At what age can professionals test children for APD? Speech-language pathologists and pediatricians can screen children for APD, but only a licensed and trained audiologist can make a diagnosis. With current tests, some information about APD can be determined at age four. Considerable information about auditory processing skills is measureable at age five, and readily diagnosed from about six years of age. Below age seven, however, audiologists are cautious of making a diagnosis of APD. Sometimes if there are strong indicators of APD at a young age, an audiologist may make a “provisional” diagnosis of APD or state that the child is “at risk”. If the child is clearly experiencing auditory impairment, it is important is to collect as much information as possible and start treatment early. Can children diagnosed with APD “grow out of it”? Yes and no. Children can ‘grow out’ of most anything with the right stimulation and training. 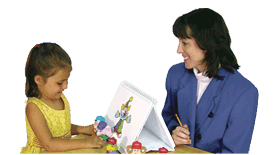 For example, if a child is actually listening, then the act of listening itself helps improve auditory processing. However, many children with APD lack the tools necessary to improve listening skills on their own. When a student with Auditory Processing Disorder is not listening to his teacher, the teacher may consider him a behavior problem. If a teacher does not recognize that a student actually has a problem (APD), the teacher may keep him in the back of the room to avoid his disruption to other students. Then, the student tunes out more and more and eventually discovers (because he cannot hear the teacher very well) that it is much more fun to misbehave and entertain the students around him. This student’s auditory processing will not get better because he is not receiving auditory training in the classroom. Direct intervention improves processing. It is for this reason that neuroscientists developed programs to improve auditory processing skills. Many children need specific stimulation, or extra brain training, to develop age-appropriate auditory processing skills. Children can manage their APD if the stimulation is right, if the APD is not too severe, and if they have the right kind of stimulation to refocus the brain in a different direction. The brain’s neuroplasticity allows it to reorganize itself in order to adjust to new situations or changes in environment. More often than not, an auditory training program designed to improve certain parts of the brain must be involved. Educators and/or parents cannot “wait and see” if the child outgrows it. How can educators and parents help? It depends on the child. There are no medications to treat APD, but classroom accommodations and assistive technology devices are great, non-medical ways to get children with Auditory Processing Disorder on the path to success. An Individualized Education Program (IEP) or 504 Plan can include accommodations specific to the areas of weakness or concern agreed upon by the IEP team in an IEP meeting. One simple thing educators can do is give the child “preferential seating” near instruction in the classroom; therefore, when the child is in school for five hours, he/ she is receiving the best auditory signals possible. Teachers and parents should talk to the child in quiet environments. This is a strategy to use with all ages, and is especially crucial before age 5. At home, parents can help by turning off the TV and technology and getting a book to read with their child. All of these are helpful stategies and are very important for auditory processing development. However, these strategies may not be enough. Parents may bombard their children with language through talking and reading, and yet the auditory processing difficulties are still identifiable when they reach school age. These children need direct training to appropriately access the classroom environment and avoid the enduring negative impact of processing problems on through adulthood. If you suspect your child has auditory issues or an Auditory Processing Disorder, contact your child’s teacher and request an initial or informal screening by the speech therapist in your school or in your school district.